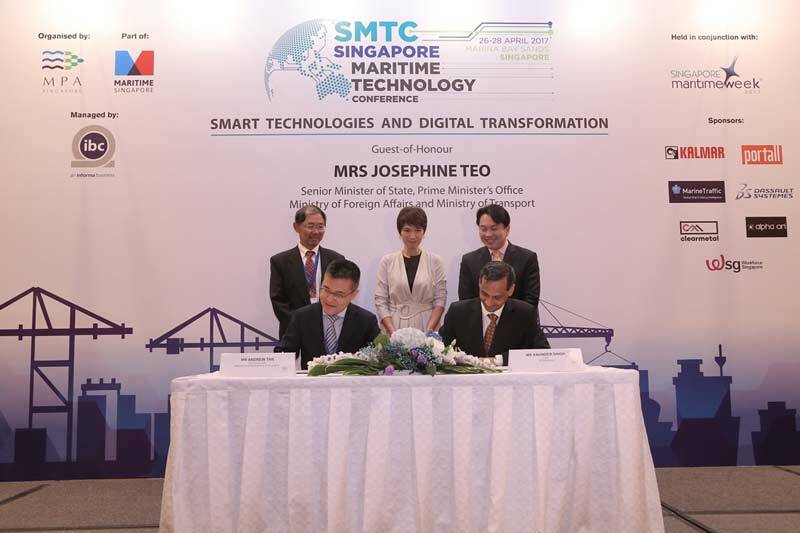 In a strong demonstration of commitment to advance innovation and build technological capabilities, the Maritime and Port Authority of Singapore (MPA) has signed five Memorandums of Understanding (MOUs) with local and international partners today at the Singapore Maritime Technology Conference (SMTC). These MOUs aim to catalyse research, innovation, as well as pilot adoption of emerging technologies and enhance information flow and connectivity within the maritime community. Held from April 26 to April 28 2017 at Marina Bay Sands in conjunction with Singapore Maritime Week 2017 (SMW 2017), SMTC showcased prominent maritime and port technology trends and developments across 80 presentations from 14 countries, and was attended by over 450 participants from 20 countries. In February this year, MPA also renewed an MOU with DNV GL which will promote maritime R & D in areas such as intelligent shipping systems, green ports and marine environment projects. As part of industry transformation efforts to drive competitiveness and new growth areas, these MOUs are a step forward to forge even closer collaborations with industry partners, technology developers and research institutions to build up technological capabilities within the maritime industry. First signed in 2011 under the MPA-PSA Port Technology Research and Development Programme (PTRDP), the MPA-PSA MOU has been renewed for the third term for a period of three years starting today. Enhancing collaboration in the research and test-bedding of new technologies for the future Tuas Terminal, the renewed MOU is a combined S$30 million commitment from both parties to further boost the PTRDP, and aims to step up R&D and capability development in the areas of digitalisation, connected community systems, and automation and robotics. Under the PTRDP, and together with other technology providers, institutes of higher learning, research institutes and companies, significant developments have been made in areas of automated operations. PSA has also set up the PSA Living Lab in 2016 to enable technology solution providers and start-ups to collaborate with PSA to develop ideas and test-bed integrated systems in a “live” port environment. The focus and technology areas in the enhanced programme will include the test-bedding and applications of technologies, such as artificial intelligence, data analytics, emulation, Internet of Things (IoT), cloud computing, blockchain, augmented reality and video analytics, to build collaborative business platforms, optimise operations and develop smart port equipment and systems and automation. The programme will also support PSA unboXed initiatives. Under the Maritime Green Port and Productivity Solutions (GPPS) signed in 2011, JP-MPA and other technology providers collaborated to research and test-bed potential new concepts for the application of port technology, including port equipment mechanisation and automation, port optimisation and green port technologies. With focus on transformation, the MPA-JP MOU has been renamed to “Jurong Port Transformation – Developing Next Generation Multipurpose Port (NGMPP)” and extended for a second term of another five years. Both MPA and JP have each allocated a sum of S$8 million to this joint programme. Existing collaborations between MPA and local terminal operators have already resulted in several innovation projects such as PSA’s development of cost-effective Automated Guided Vehicles (AGVs) and automated wharf and yard operations, as well as Jurong Port’s projects relating to both cement and general cargo terminals, which are expected to increase manpower productivity. To advance efforts in maritime technology R&D, MPA also signed an MOU with Singapore Technologies Electronics Limited (ST Electronics) today at the SMTC. Under the three-year MOU, MPA and ST Electronics will collaborate on R&D projects to enhance port and shipping operations, as well as develop technology standards with industry partners. On top of the MOU signed between MPA and ST Electronics, two additional MOUs were signed with industry partners. These two MOUs focus on the developments of smart ships as a complement to the deep technology emphasis of current collaborations with other partners. The first was the MPA-Lloyd’s Register (LR) MOU on Maritime Technologies R&D. The MOU will build upon strong existing collaborations (e.g. enhanced understanding of Cargo Liquefaction to increase vessel stability and safety, Extreme Wave Impact to optimise time and cost of semi-submersible rig design) and extend into Big Data and Intelligent Systems for real-time condition monitoring, Unmanned Systems & Robotics for operations, maintenance and inspections and Emerging Areas such as 3D Printing (metal Additive Manufacturing). The final MOU signed today was a four-party collaboration between MPA, Alpha Ori, LR and NUS’ Technology Centre for Offshore and Marine (TCOMS). Under the MPA, Alpha Ori, LR and NUS’ Technology Centre for Offshore and Marine (TCOMS) MOU, the parties aim to jointly establish a Centre of Innovation and conduct joint research in the areas of Data Analytics for Smart Shipping, use of Robotics and Unmanned Systems in port and shipping for operations, maintenance and inspections in hazardous zones, and maritime cybersecurity. said Mr. Andrew Tan, Chief Executive of MPA.